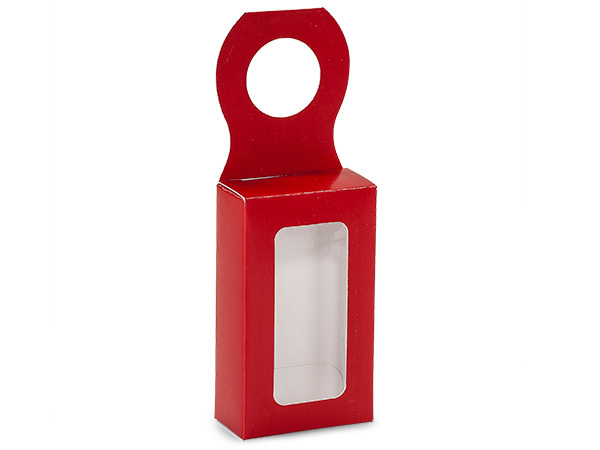 Small Red Bottle Hanger Favor Boxes are perfect for creating gift sets of chocolate and wine, herbs and olive oil or bath and body sets! These boxes are easy to assemble with tuck top and bottom. Useable dimensions: 2-1/4x1-1/8x3-7/8" Dimensions including hang tab 2-1/4x1-1/8x6-1/2". The hole measures 1-1/2" in diameter and fits cleanly over most bottle necks. You can also tie them onto gift bags! See All Wine & Bottle Packaging - Add a Custom Printed Label! Bottle Hanger Favor Boxes are perfect for creating gift sets of chocolate and wine, herbs and olive oil or bath and body sets! These boxes are easy to assemble with tuck top and bottom. Clear 1-1/4 x 2-7/8" acetate window shows off your pairing, and the 1-1/2" die cut hole fits cleanly over most bottle necks!